Martchenko, Michael. Very Good. Stephanie decides to be different from her classmates and ties her hair into a ponytail. The next day all the girls at school have ponytails! Trade paperback (US). Picture book. Glued binding. 24 p. Contains: Illustrations. Classic Munsch. Intended for a juvenile audience. Martchenko, Michael. Good. 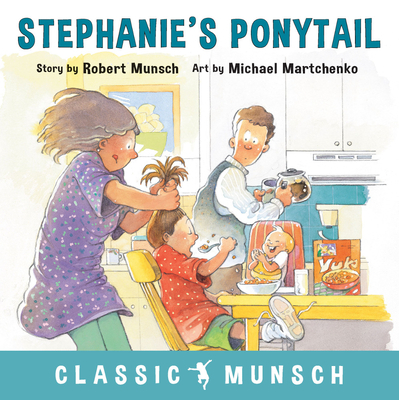 Stephanie decides to be different from her classmates and ties her hair into a ponytail. The next day all the girls at school have ponytails! Trade paperback (US). Picture book. Glued binding. 24 p. Contains: Illustrations. Classic Munsch. Intended for a juvenile audience. Martchenko, Michael. New. Picture book. Sewn binding. Cloth over boards. 36 p. Contains: Illustrations. Classic Munsch. Intended for a juvenile audience. Acceptable. Sticker on front The book is a readable copy showing signs of wear and the pages are intact. The cover may have some creases or minor tears. The dust jacket (if applicable) may be missing. The book may be an ex-library book. The book may contain: a publisher remainder mar some highlighting All orders guaranteed and ship within 24 hours. Your purchase supports More Than Words, a nonprofit job training program for youth, empowering youth to take charge of their lives by taking charge of a business. Stephanie persists in having a hairdo unlike everyone else's, AND figures out how to stop everyone from copying her ponytails! Written with a repetition to the core lines that make it easy for my 4 year old son to follow, but the theme is 4th-5th grade....my 10 year old like to read it to his little brother. Just when you think you know how things should go for 4th and 5th grade boys and girls, Munsch shakes up a cultural assumption or two. Love it.